Acer isn’t bashful when it comes to who it built the Chromebook Spin 11 for. This is a rugged Chromebook that can handle an accidental spill, the occasional drop from a desk or someone standing is meant to be in a classroom, of course. Chromebooks range in price and size, from the smaller 11.6-inch display found on the $399 (about £303, AU$522) Spin 11 to the $199, 14-inch HP Chromebook 14 or the $499 Asus Chromebook Flip with a sharper, 12.5-inch display splitting the difference. However, only the Spin 11 offers what amounts to be a built-in protective case. That said, being able to withstand some abuse isn’t the entire story for the Spin 11. Its modest specs, combined with impressive battery life, make a case for it to exist outside the classroom. 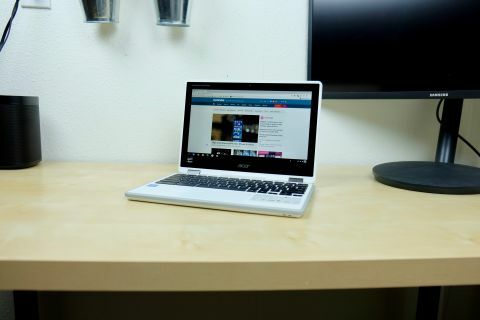 The exact model sent to TechRadar for the purpose of this review is listed on the Acer website at $399 (about £303, AU$522). However, it’s not available for purchase from the Acer website – only Amazon – in the US. There are two similar models listed on the Acer website, both of which are available for purchase. One (the R751TN-C5P3) is listed at $399 (about £303, AU$522) and has identical specifications, save for the lack of an IPS Pro panel, and comes in black. A slightly less expensive $349 variant also has the same specs, but forgoes any sort of webcam. Taking the standard asking price of the Spin 11 into account, it’s not the most expensive Chromebook on the market, with Google’s Pixelbook obviously taking that crown. But, it is one of the uglier Chromebooks we’ve seen at the nearly $400 mark. For example, the HP Chromebook 14 is half the cost and looks a heck of a lot better. Add another $100 to the price, and the Asus Chromebook Flip blows the Spin 11 away aesthetically and in performance. Of course, neither are likely to take a smack on the floor as well as the Spin 11 can. With an 11.6-inch HD display, the overall size of the Spin 11 is very easy to tote around or throw into a backpack. At just 3.09 pounds (1.40 kg), it is a tad heavy for a device with dimensions of 11.65 x 8.11 x 0.82 inches (29.6 x 20.6 x 2.08 cm; W x D x H), but it’s nothing to get upset about. The entire housing is made of a durable plastic, with rubber bumpers around the edges. According to Acer, the Spin 11 is US MIL-STD 810G military spec certified for rough environments and abuse. Surrounding the display is a thick, black bezel with a 720p webcam centered along the top. Another camera, intended to be used when the laptop is in tablet mode to snap photos or video from the rear of the device, is centered just above the keyboard. On the left side of the housing is where you’ll find the headphone jack, a microSD card reader, a USB 3.0 port, a USB-C port and the power button. On the opposite side is another USB-C port, USB 3.0 port and a volume toggle. Both the power button and the volume toggle are covered in rubber and don’t have much of a tactile feel to them. Each button is even with the exterior, making either one hard to find just by running your finger along either edge. The touchpad is smooth and provides a reassuring click when pressed. There are no issues with palm rejection – even with our hands resting directly on the touchpad during the majority of our typing. The keyboard's keys are recessed as a means to further protect the keys. The adjustment of typing from above on the keyboard was minor, if at all, and we found the keyboard to be rather pleasant to use. The Spin 11 doesn’t look like a nearly $400 laptop, due to its ruggedized materials. It looks like a less expensive Chromebook mixed with a toy laptop from Mattel. Granted, it’s not designed to look impressive for kids at school to show off with. Instead of one hinge that goes the length of the laptop, there are two separate hinges. Each hinge can move nearly 360-degrees, making the Spin 11 flexible enough to sit with the screen against its base, or stand up like a tent, without any fuss. Yet it’s sturdy enough that a bump or knock on the desk won’t cause it to fall flat. Acer included channels under the keyboard capable of handling up to 11 ounces of liquid spilled on it. The channels are designed let the liquid drain, without causing any harm to the laptop itself. Additionally, Acer states the Spin 11 can survive a fall of 48 inches and withstand someone weighing up to 132 pounds standing on it. There’s little doubt once you pick up the Spin 11 that it’s designed to take abuse. Outside of design, which admittedly is a matter of personal taste, the display is disappointing. At 11.6-inches with a resolution of 1,366 x 768, we don’t quite get a full HD experience. When viewing text on the IPS Pro LCD panel, letters look a bit rougher around the edges. Overall brightness is also lacking, forcing us to leave it on max brightness – even in a well-lit room. The display doesn't make the Spin 11 unusable but, at this price, we hoped for more. Included in the box is a Wacom stylus. It’s the same size and shape as most pens or pencils, and even has a button on the top with just enough give to leave you with the impression that it actually does something. There’s nothing fancy about the stylus, it’s just a long piece of plastic molded to look like a writing utensil. Unlike more sophisticated styli, there’s not a battery or Bluetooth connection to worry about. Simply hold the stylus to the screen and draw or write. There’s a bit of lag between a pen stroke and digital ink showing up on the screen, but for students who are jotting notes or sketching during a lecture, it’s enough to get the job done.